This is so easy; it barely warrants a recipe, since the main ingredient is store-bought. However, it might be a fun party for all ages idea, and because who doesn’t like food cut into shapes? Okay, it is weird when it’s a real animal but vegan tuna in fish seems harmless. Add vegan tuna, Vegenaise, and thyme to a bowl and mix. Cut bread into fish shapes. Compose “sandwiches” and serve. From my limited experience, I think vegan seafood can be tricky. My personal opinion is that the product, for a tricky ingredient, is fine. Rinsing it does change the consistency to be more mushy, so if you are okay with the salt and oil level you could use it as is. 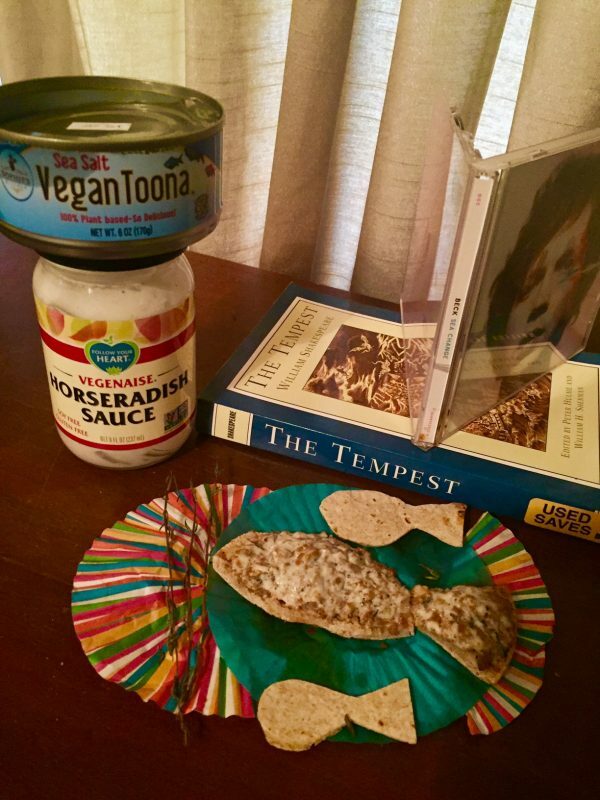 I do not enjoy hot spice but don’t mind the little taste kick of Vegenaise Horseradish Sauce. To mellow out the flavors, I put in the thyme. You could definitely leave that out if you don’t agree or you don’t have some on hand. You could even try another herb or spice. If you’re curious, here’s a little explanation on the name and relation to the theme. I had this abstract idea of “Changes” and something relating to the colorful album which would lead to a colorful dish. Based on my memory, it was a David Bowie album, but it really led me to another by Beck. The Beck one seemed more on point, and I had the CD handy. The name of the Beck album is…wait for it… Sea Change! “Toona” + New Year/Changes Theme = you get it. I had never tried the “Toona” before this, and it was also a good reason to use it. I added the picture of Shakespeare’s The Tempest because the term “Sea Change” is attributed to that work (see: Merriam Webster online) Also, I am a librarian and former English major, so there’s that :). For all the recipes on the “Changes” theme, and another picture of this one, please see the January 2017 VBC post on this site. One Response to "Sea Change Tuna Treats"